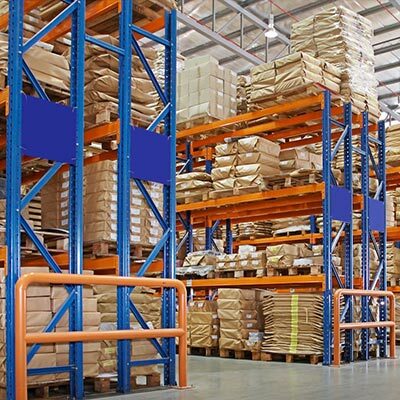 The efficiencies and quality of a designed industrial storage system immediately impact the bottom line. Two and three level industrial shelving systems are designed to maximize the use of floor space by taking advantage of unused overhead space available in existing facilities. Multi-tier systems are a cost-effective alternative to new construction. Business Systems and Consultants excel at designing and deploying storage systems for distribution centers and warehouses. Business Systems and Consultants industrial shelving systems are engineered and manufactured for efficiency and durability. Our industrial shelving systems can be combined with high-density drawers for maximum versatility and the shelving is used to create high-rise industrial shelving. Industrial shelving systems for backroom storage is simple and economical: No nuts, bolts, clips or cross braces—just posts, beams and decking that assembles in minutes using only a rubber mallet. With this unique boltless and clipless system that uses beams, posts, and decking, you can easily build a strong and durable steel storage rack in a matter of minutes. Along with being economical to purchase, this system can also save money because of the minimal assembly, which reduces labor and installation costs. These shelving units have shelf widths of 48 inches and can accommodate spans of 48 to 96 inches. Moreover, this open-style system allows you to access shelves from four sides, making them convenient in any space. 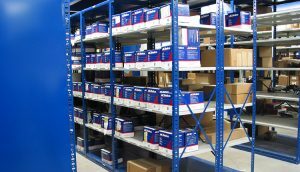 Rivet-Span shelving solutions are available in bulk rack styles, shelf units, and specialty systems that can be arranged and configured in multiple ways to suit a variety of applications. Along with being rigid and durable, these storage systems can even increase usable storage space by as much as 75%, and this could mean the difference between you minimizing costs and staying in the same facility versus having to move to a newer and larger space. No two organizations have the same storage needs, and what works for one company won’t necessarily work for another, even when you’re dealing with high-density storage. When regular high-density storage isn’t enough, there are multi-tiered systems that can help you maximize the vertical height of your facility while minimizing the footprint of your storage space, and this means more room for resources, movement, and organization. For 40 years, Business Systems and Consultants Inc. has been helping organizations to choose and build industrial storage and material handling solutions that are ideally suited to their specific needs, spaces, and configurations. We know all the best manufacturers and all the best products for different applications, and can help you choose a storage solution that will allow you to increase storage area while reducing the amount of floor space used for materials; this improved use of space means cost savings and other benefits. Beyond that, the right storage system can also help you improve organization, and that means increased efficiency and productivity as well. To learn more info, or to schedule a free assessment, contact BSC about storage solutions today.